These are the photo's I took when DH, DS and I went for a walk in the local wood in September. I also lightened up the bear's and DS photo's using Lorraines tut from Nottingham. Hope you like this, even DS liked the title. This is the LO done at Tina's on Saturday, we had to use Perfect Pearls. 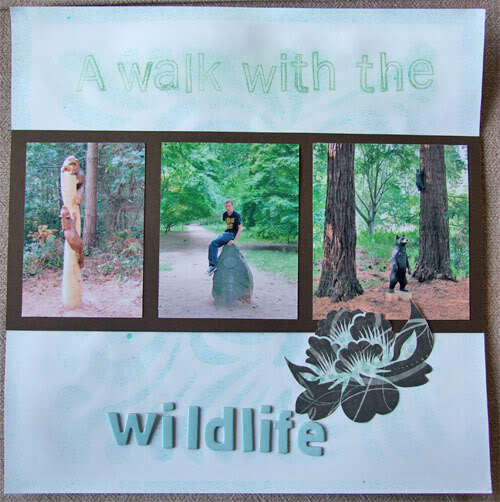 I did spray over the white background card using a mask but it didn't show very well so we turned the mask by one quarter and used Tina's sprinkle spray, and I used the PP's on the title at the top of the page stamping with clear embossing ink and taping the powder on top like embossing powder. Still to do the journaling but that is just when and where. I like the way you have put the photos across in a strip. Super LO Alison. I like the strip too but I'm a bit confuzzled. You went to the local woods and it has BEARS in it??? I may be having a cell dying moment but do we actually have bears in this country? Keep up Lorraine, they look like wooden ones to me! Lovely layout this - it shows everything from a lovely time in the woods. Sorry Lorraine I should have explained. So now I know the journaling needs more than the date and place. The only living wildlife is in the middle photo, my boy sat on the arboretum stone. The Bears (have you spotted the baby up the tree? and the Beavers are carved from the tree's that have had to be felled, the baby bear is attached in it's place. Well thats cleared one thing up, infact two cause was wondering what was on the right side of the LO, its beavers, didn't think they could climb but must be wrong LOL. No Billie I don't think they can climb either but it is just a man and his chainsaw so we have to let him do his thing, he is very good there are lots of totempoles around this town where rather than just chop a big old sick tree down he comes along and works his magic. Graet photo's and a lovely LO the misting worked well. Oh, sheesh. How stupid am I? Or, maybe not. At least I knew there were no bears....even though I was doubting myself. oooh id love to see those bears . sorry not looked at this til now (was saving it til i had more time , not ignoring it alison ) so thats why i did not understand the bear posts in incidental. What a great LO. It's a conversation pieces isn't it. I hadn't realised the bear weren't real until you said.